This one is very snazzy. I think that blue really brightens up the whole room. Taobao is China’s version of Amazon. 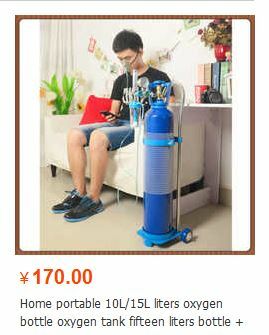 It is China’s “largest online shopping platform.” It is the place where you can order just about anything under the sun, except apparently not an Iron Lung. It turns out Iron Lungs are really, really large contraptions, about the size of a tanning bed. However, if you want to buy bottled oxygen you can. They come in all different kinds of bottles, in a range of colors even. There are the kinds for home use and the ones for taking on the go. There are also ones especially marketed to pregnant women or students or travelers. You can get your oxygen bottles in 2, 4, 10, and 15 liters for home use. 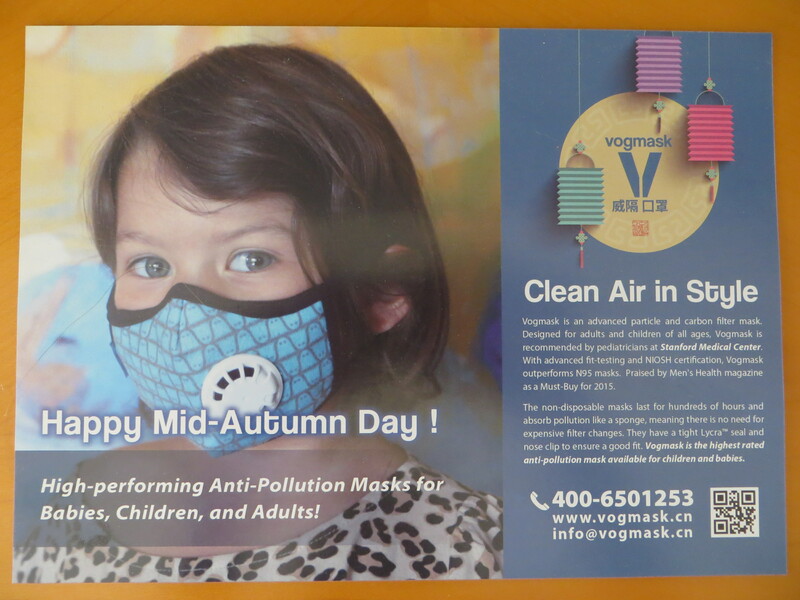 On Taobao you can also purchase any number of anti-pollution masks. In fact a China Daily article from December 2015 noted a steady rise in the mask orders from the online market. Some are very stylish. Some are cute. Some are, well, interesting. If you have been hankering for a face mask that looks like you have a teddy bear on the lower half of your face then you can make that happen. Probably the most popular are the basic white 3M disposable masks. Although unfortunately that mask you buy might not be real. It might cover your face but not protect you from the pollution. In December 2015 Chinese customs authorities seized 120,000 counterfeit masks in two separate raids. Counterfeit face masks, who would have thought? Well, it is China. C and I get wacky in our Vogmasks. The other day I saw a woman walking toward me in the street and I noticed her striking face mask. It was black with silver adornments. Although what popped into my mind was “Hannibal Lecter,” which admittedly sounds gauche rather than graceful, I did find myself thinking I would like to have a mask like that. Is this what it has come to? My coveting anti-pollution masks as an accessory? As far as I know Louis Vuitton and Juicy Couture are not yet into designing face masks, but is it only a matter of time? Should I get in on this before it is too late? Honestly, as stylish and fashionable as my mask is I am not that into wearing it. I wear glasses and whenever I put on the mask, which tends to be in winter when the air quality levels are on average worse, they fog up. 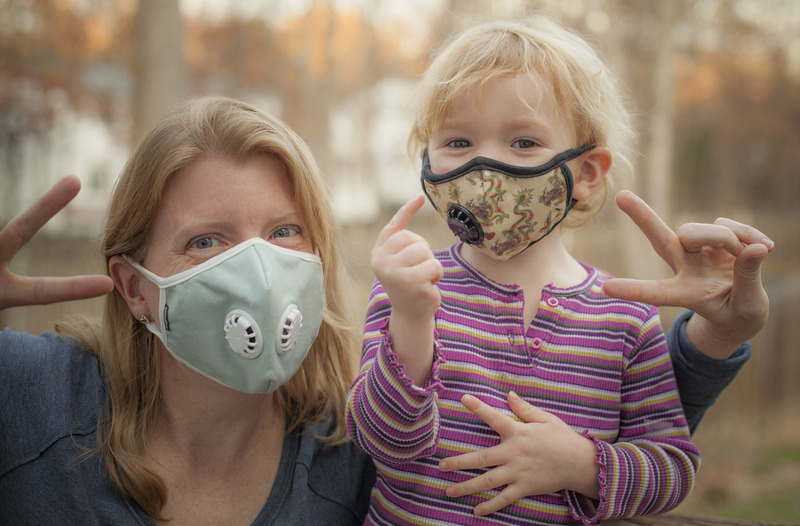 In general if the air quality levels are high, over 150, I try to limit my time outdoors and my nanny keeps my daughter inside. On weekdays that is pretty easy. I live only a ten minute walk from work and there is an indoor play area for kids within the building. On weekends it can be a downer if I have plans to get out for a walk or head to a museum. Poor air quality can be the deciding factor in our extracurricular activities. If we do have to stay indoors though the Consulate provides us with BlueAir purifiers; they are reportedly some of the best on the market. We receive one for each room. At least every six months the management section delivers us new filters and we change them. It is super easy to change them but it is astonishing how dirty the filters are after six months in a small apartment even with four purifiers running. Few things say “have a great holiday” than buying yourself or your loved ones an anti-pollution mask. I do not know where Shanghai’s average PM2.5 level falls. I have a colleague though who could probably tell you as he has created a spreadsheet or a computer program that figures out the average and he can tell you the range for each city where we have a diplomatic mission in China. This is the kind of thing I guess some people do for fun in China. To think that before I arrived in Shanghai I never once thought about checking the Air Quality Monitor (AQI). Now it is something I check fairly regularly. It is part of my vocabulary. I do not check the monitor so much now as I used to when I first arrived though. One hardly needs to check when just a glance out the window will give you the kind of “mask” or “no mask” indication you are looking for. If you want the exact numbers so you can complain smartly at work, then yes, you will need to check it. But if I haven’t checked it, then I am sure someone at work has. All kidding aside, the pollution levels may have some long term affects on myself and my child and I do not yet know what they might be. In the short term however I do notice that I need to use my asthma inhaler more in China, and particularly more in the winter. And in October I was Medevac’d to the US for a procedure for a heart condition I developed in China. I have no idea if the air quality had anything to do with it but I did not have a heart condition before I came to Shanghai. I sometimes daydream about being somewhere I do not have to think about AQI. There are so many places on my projected bid list for my next tour that might not fit that bill. I wonder if I will eliminate them as a result? There are days when I suppose the only reasonable next place should be an island country with few high rises, few polluting industries, few skyscrapers. A place I might reset the damage done this tour. When on vacation outside of China, away from the AQI monitor I do feel liberated, and I realize how much it does affect my life in Shanghai. When in Shanghai, I get used to it. Is this the next step? 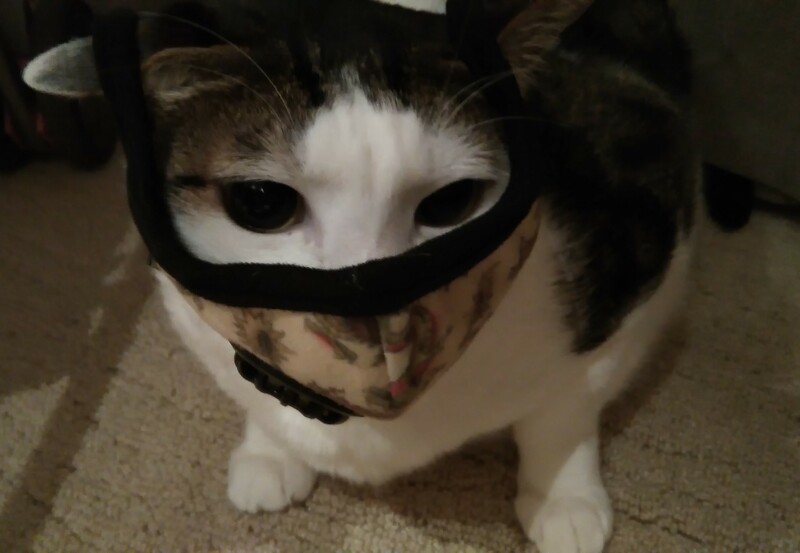 Do my cats need their own kitty masks? And yes, this is my actual cat. And yes she kept this mask on and let me take pictures.